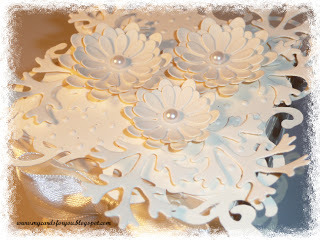 It's a two for one kind of day here at Paper Crafting World! Design Team members Janet and Jen have teamed up to bring you not one, but TWO cartridges in our Market Fresh Mondaze Showcase. Janet is showcasing some of her beautiful creations made with the Cricut Tags, Bags, Boxes & More 2 cartridge and Jen is bringing you some cute creations made with the original Tags, Bags, Boxes & More. Take it away, ladies! This week, I have put together a number of projects I made using the Tags, Bags, Boxes and More 2 cartridge. I have used it so much since I bought it a month or so ago and I can see that it will be used a lot more in the future as well! I use this cartridge with the Cricut Craft Room which makes it really easy to size your project and make your layers. When you purchase the cartridge, you also get a handbook showing each of the buttons and cuts, and another book showing how to make the boxes up. The pictures are a little small, but are reasonably easy to follow. A must with this cartridge is the embossing tool that is used in place of the cutting blade. This tool makes the score lines for your project, which are on a separate layer. 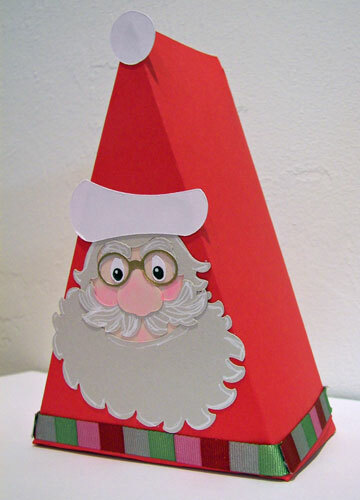 All you need to do is place the embossing layer on top of the shape you are cutting and fit it to the same size, then, when you cut, tell the computer which layer you are "cutting". For each button on the cartridge, there is a box (cut in one piece for 12 x 12 mat users), two box sections (for smaller mat users), a tag with a layer, a card, and one or two phrases with layers. This is just a basic box -- believe it or not! The box can be found on page 59 of the manual that comes with the cartridge (design no. 32). I cut the box then I designed and cut the fancy edged squares for the top and bottom of the box. I used one of Melin's beautiful swirly hearts designs for this. I also made some swirls to go around the edge of the lid. You can see them peeking out from beneath the ribbon. To finish the lid off, I embossed the square center part of the additional die cut with the swiss dots folder then added some die cut flowers and leaves to finish it all off. The flowers have little pearl bling in the center of each one. I fell in love with this cute box. It is found on page 56 (no. 29) of the handbook. I cut the box, then covered the front skirt piece with black lacy paper and real lace trim for the top, adding a little black trim in the join. Lace and ric-rac were added to the bottom of the skirt piece. 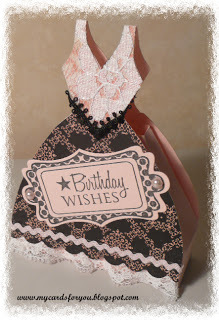 The sentiment was stamped and die cut then added some pearl bling to finish it off. Not only does this cartridge have loads of boxes in various shapes and sizes, it also has phrases and tags that you can use. For this card, I used the phrase on page 41 (no. 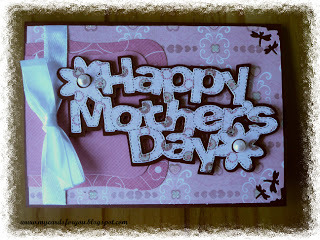 16) to make a Mother's Day card. I cut the phrase and a layer, added some faux stitching and bling then attached to my card. Christmas is coming, all too fast, and this cartridge has some cool Christmas stuff as well. This card uses the phrase on page 48 (no. 22) that I cut, embossed then layered on to a base card. 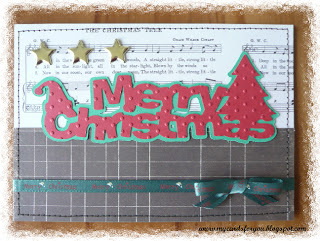 Die cuts like this make Christmas Card making simple! Finally, we all need tags for attaching to gifts and this cartridge is full of tags. Each of the boxes on the cartridge has a tag and phrase with it so you can mix and match. This snowflake tag can be found on page 47 (no. 21). I cut it from white card stock then embossed it with my snowflakes folder. I added some embossing ink with the brayer, just so it caught the raised parts of the tag then heat embossed it with psychedelic embossing powder. The tag was then layered on the pale blue background, also cut from the same button. 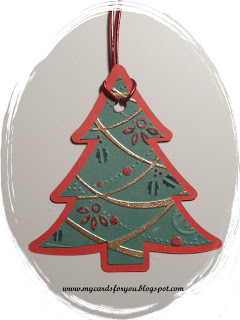 The Christmas tree tag can be found on page 48 (no. 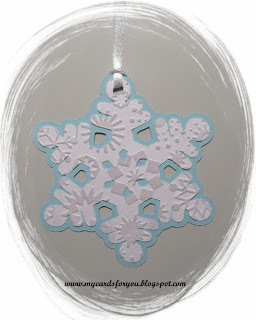 22) and I used the same techniques as for the snowflake tag, using different colored embossing powders and an embossing pen instead of the brayer. This cartridge is so versatile and has so many different uses. If you don't already have it, you really should think about getting a hold of it! The original Tags, Bags, Boxes & More cartridge was one of the first cartridges I bought after I purchased my Cricut. And I have used it for tons of projects! This cartridge is retired now, but don't worry -- Cricut has released it in digital form in their Cricut Craft Room. TBBM has six creative features: Window, Mirror, Mirror/Window, Mirror/Windows, Shadow, and Blackout. 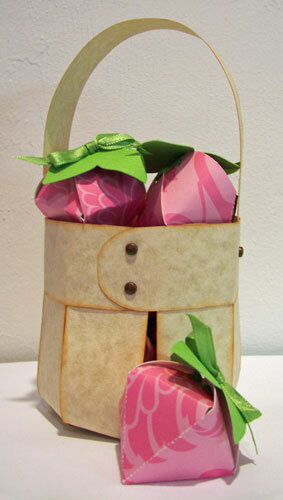 It also features a wide assortment of tags; and the bags and boxes are perfect for party favors and gift giving. I decided to challenge myself to create something out of the tags and other elements on the cartridge. So first up is a basket and some strawberries. The basket was made using the long rounded-end rectangle found on page 101 of the handbook. And the strawberries were created by welding together five of the oval tags (found on page 83) using Cricut Design Studio software. The strawberries are closed with a piece of green satin ribbon strung through holes on the top of each "petal" and then pulled up through the leaf topper and tied in a bow. They are the perfect size to hold a Hershey Kiss candy! This is the cube box found on page 119. The top two boxes are the same size and then the middle and bottom were each cut a half of an inch larger to give the graduated effect. The brim of the hat was cut using the round tag on page 82. 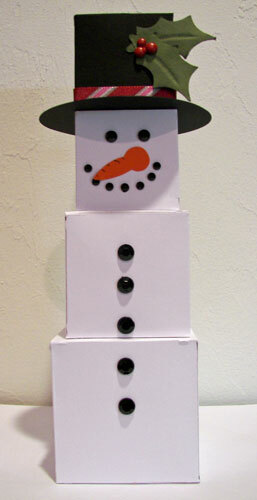 The snowman's carrot nose is one of the shapes found on page 111. I used some strong double-sided tape to stick the box bottoms to the box tops -- each box still opens, they're just connected. 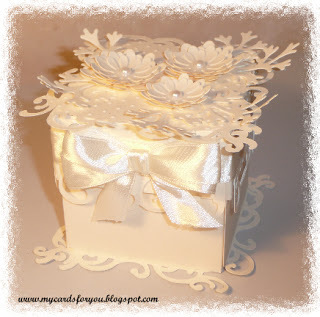 Next up are two gift boxes made using the cake slice box on page 126. 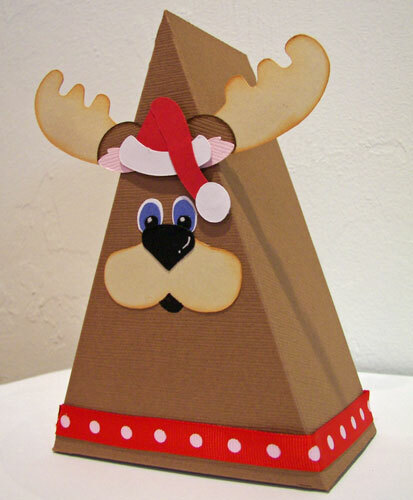 I used parts of the adorable Santa & Rudolph cutting file from PaperCraftingWorld.com to decorate the fronts of the boxes. I hope I have inspired you to "think outside the box"! It is amazing what you can come up with when you study the different cartridge elements and put on your thinking cap! We hope you've enjoyed this peek at two fantastic cartridges! Please take the opportunity to head over to our Designer's blogs to check out the details and let them know how much you enjoyed their projects -- Janet's blog is My Cards for You and Jen is at Musing of a Crafty Mom. Don't forget to stop back by tomorrow for our weekly PCW Die Cut or Stamp Challenge and Wednesday for our weekly "Crafts With Cutters" Challenge! These are all such FANTASTIC projects!! And I'm so happy I have both these carts :D Great job ladies!! wow! Jen, I love that you used more than just the boxes - just so clever. The Santa and Reindeer are especially fun. Janet, your box is stunning. Great showcase, ladies. Wow, ladies! What a great cartridge(s) showcase! All the boxes, tags, and cards are just beautiful! Oh wow!! These are all amazing!!!!!! !